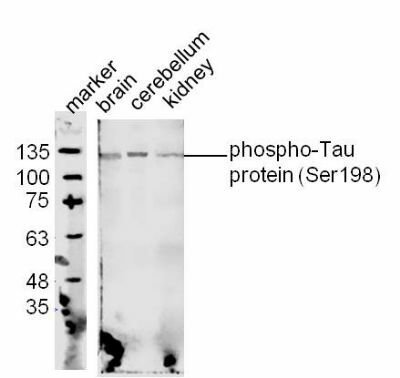 别 名 Tau (phospho Ser198); p-Tau (phospho S198); Tau (phospho S198); MAPT(phospho S198); MAPT; Microtuble-associted protein Tau; AI413597; AW045860; DDPAC; Disinhibition dementia parkinsonism amyotrophy complex; FLJ31424; FTDP 17; FTDP17; G Protein beta 1 gamma 2 subunit interacting factor 1; G protein beta1/gamma2 subunit interacting factor 1; MAPTL; MGC134287; MGC138549; MGC156663; Microtubule associated protein tau isoform 4; MSTD; Mtapt; MTBT1; MTBT2; Neurofibrillary tangle protein; Paired helical filament tau; PHF tau; PHF-tau; PPND; pTau; RNPTAU; Tauopathy and respiratory failure, included; TAU_HUMAN. This gene encodes the microtubule-associated protein tau (MAPT) whose transcript undergoes complex, regulated alternative splicing, giving rise to several mRNA species. MAPT transcripts are differentially expressed in the nervous system, depending on stage of neuronal maturation and neuron type. MAPT gene mutations have been associated with several neurodegenerative disorders such as Alzheimer's disease, Pick's disease, frontotemporal dementia, cortico-basal degeneration and progressive supranuclear palsy. [provided by RefSeq, Jul 2008]. Polyubiquitinated. Requires functional TRAF6 and may provoke SQSTM1-dependent degradation by the proteasome. PHF-tau can be modified by three different forms of polyubiquitination. 'Lys-48'-linked polyubiquitination is the major form, 'Lys-6'-linked and 'Lys-11'-linked polyubiquitination also occur. O-glycosylated. O-GlcNAcylation content is around 8.2%. There is reciprocal down-regulation of phosphorylation and O-GlcNAcylation. Phosphorylation on Ser-717 completely abolishes the O-GlcNAcylation on this site, while phosphorylation on Ser-713 and Ser-721 reduces O-GlcNAcylation by a factor of 2 and 4 respectively. O-GlcNAcylation on Ser-717 decreases the phosphorylation on Ser-721 by about 41.5%. Glycation of PHF-tau, but not normal brain TAU/MAPT. Glycation is a non-enzymatic post-translational modification that involves a covalent linkage between a sugar and an amino group of a protein molecule forming ketoamine. Subsequent oxidation, fragmentation and/or cross-linking of ketoamine leads to the production of advanced glycation endproducts (AGES). Glycation may play a role in stabilizing PHF aggregation leading to tangle formation in AD. Note=In Alzheimer disease, the neuronal cytoskeleton in the brain is progressively disrupted and replaced by tangles of paired helical filaments (PHF) and straight filaments, mainly composed of hyperphosphorylated forms of TAU (PHF-TAU or AD P-TAU). O-GlcNAcylation is greatly reduced in Alzheimer disease brain cerebral cortex leading to an increase in TAU/MAPT phosphorylations. Defects in MAPT are a cause of progressive supranuclear palsy type 1 (PSNP1) [MIM:601104]; also abbreviated as PSP and also known as Steele-Richardson-Olszewski syndrome. PSNP1 is characterized by akinetic-rigid syndrome, supranuclear gaze palsy, pyramidal tract dysfunction, pseudobulbar signs and cognitive capacities deterioration. Neurofibrillary tangles and gliosis but no amyloid plaques are found in diseased brains. Most cases appear to be sporadic, with a significant association with a common haplotype including the MAPT gene and the flanking regions. 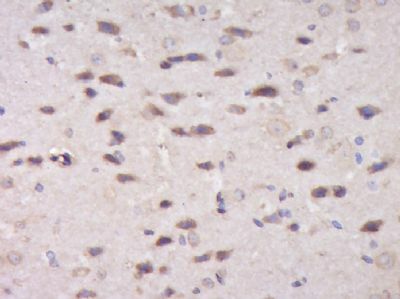 Familial cases show an autosomal dominant pattern of transmission with incomplete penetrance; genetic analysis of a few cases showed the occurrence of tau mutations, including a deletion of Asn-613. 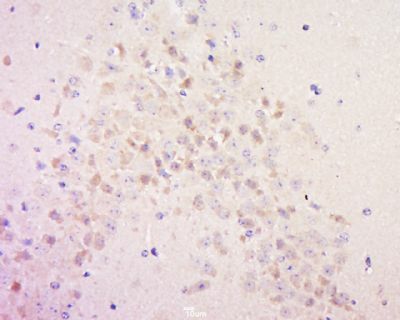 Defects in MAPT are a cause of Parkinson-dementia syndrome (PARDE) [MIM:260540]. A syndrome characterized by parkinsonism tremor, rigidity, dementia, ophthalmoparesis and pyramidal signs. Neurofibrillary degeneration occurs in the hippocampus, basal ganglia and brainstem nuclei. Paraformaldehyde-fixed, paraffin embedded (Rat brain); Antigen retrieval by boiling in sodium citrate buffer (pH6.0) for 15min; Block endogenous peroxidase by 3% hydrogen peroxide for 20 minutes; Blocking buffer (normal goat serum) at 37°C for 30min; Antibody incubation with (phospho-Tau protein (Ser198)) Polyclonal Antibody, Unconjugated (bs-4199R) at 1:400 overnight at 4°C, followed by operating according to SP Kit(Rabbit) (sp-0023) instructions and DAB staining. 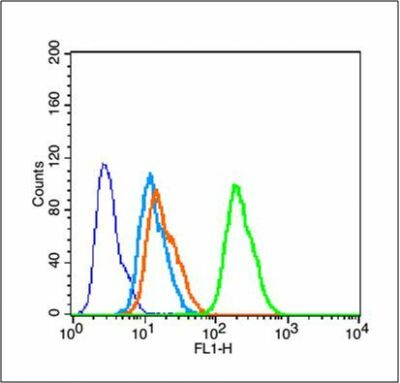 Blank control (blue line): MCF 7 (fixed with 70% methanol (Overnight at 4℃) and then permeabilized with 90% ice-cold methanol for 30 min on ice).